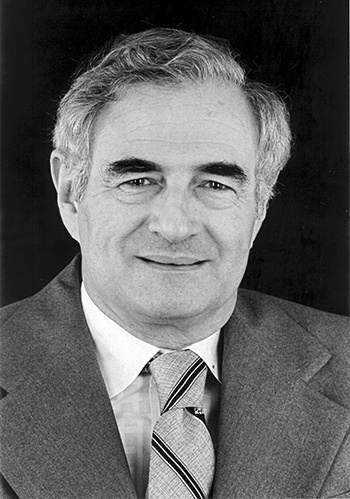 Robert L. Sinsheimer, an internationally acclaimed biologist and chancellor emeritus of the University of California, Santa Cruz, died on April 22 in Santa Barbara, California. He was 97. As a scientist, Sinsheimer made significant breakthroughs in genetic research by artificially creating functional strands of DNA. He was also one of the first scientists to propose and seriously consider that a concerted effort be undertaken to sequence the human genome. In 1985, Sinsheimer convened a group of eminent scientists at UC Santa Cruz to discuss the feasibility of sequencing the human genome. This historic workshop planted the idea for what eventually became the Human Genome Project, and UCSC scientists led by David Haussler ultimately played a crucial role in assembling the first human genome sequence in 2000. Sinsheimer was also an outspoken advocate of science's accountability to society. As early as the mid-1960s, he came to realize that advances in genetics would have profound social consequences. When recombinant DNA technology arose in the 1970s, giving scientists the ability to splice together genetic material from different organisms, he used his position as an acknowledged authority in the field to warn of potential hazards. And when he proposed sequencing the human genome, he hoped at the same time to focus attention on the social and ethical concerns such a project would inevitably raise. Sinsheimer served as chancellor of UC Santa Cruz from 1977 to 1987. He oversaw growth in academic programs and student enrollments at the campus during an era of tight educational budgets. A new undergraduate major in computer engineering was established, and graduate enrollments doubled from 350 to 700. New graduate programs and important new research activities were developed during his tenure, including major expansions in linguistics and high-energy physics and new research programs in seismology, agroecology, and applied economics. Sinsheimer was also involved in writing a new academic plan for the campus. Sinsheimer's distinguished career as a teacher and administrator included nine years as chairman of the Division of Biology at the California Institute of Technology. After his tenure at UC Santa Cruz, Sinsheimer joined the faculty at UC Santa Barbara as a professor of molecular, cellular, and developmental biology. He retired in 1990, but remained active in laboratory research for many years. In 2001, Sinsheimer received the University of California's Presidential Medal for his contributions to knowledge and to higher education. Then-UC President Richard C. Atkinson presented the medal at a ceremony during the UCSC Human Genome Symposium, noting the role Sinsheimer played in initiating the Human Genome Project, his achievements as a biologist, and his leadership of the UC Santa Cruz campus. Sinsheimer was born in Washington, D.C., and attended high school in Chicago. In 1936, at the age of 16, he enrolled at the Massachusetts Institute of Technology (MIT), intending to become a chemical engineer. Instead, he joined a new 5-year program leading to a combined S.B. and S.M. degree in quantitative biology and biological engineering, graduating in 1941. His intention to pursue graduate studies in biochemistry was interrupted by World War II, during which time he worked on aircraft radar as a staff member of the MIT Radiation Laboratory. Following the war he enrolled in the fledgling biophysics graduate program at MIT, earning his Ph.D. in 1949. Sinsheimer taught briefly at MIT before moving to Iowa State College in 1949, where he was a professor of biophysics. In 1957, he accepted the post of professor of biophysics at Caltech, where he worked for the next 20 years before accepting the position of chancellor at UC Santa Cruz. A member of the National Academy of Sciences, Sinsheimer received numerous awards and honors for his achievements. He was named California Scientist of the Year in 1968. He authored some 200 publications in his various areas of research interest, as well as an autobiography, The Strands of a Life: The Science of DNA and the Art of Education, published in 1994. Sinsheimer was pre-deceased by his wife of 34 years, Karen Keeton Sinsheimer, who died in 2015. He is survived by three children from his former marriage to Joan Hirsh—Roger Sinsheimer, Lois Wickstrom, and Kathy Sinsheimer; as well as five granddaughters—Erica Brand, Eileen Smith, Rachel Vandagriff, Jessica Sinsheimer, and Corinne Vandagriff—and four great-grandchildren, Kayla Brand, Allison Brand, Cassandra Smith, and Peyton Smith.